RIVIERA BEACH, FL – World-class anglers and fishing enthusiasts will compete for cash and prizes at the 13th Annual Horizons Fishing Tournament benefitting Hospice of Palm Beach County Foundation on Saturday, July 21, 2012, at the Riviera Beach Marina. Festivities will kick off on Thursday, July 19th with a Captain’s Meeting sponsored by Park Avenue BBQ Grill featuring dinner, drinks, entertainment and raffle prizes. 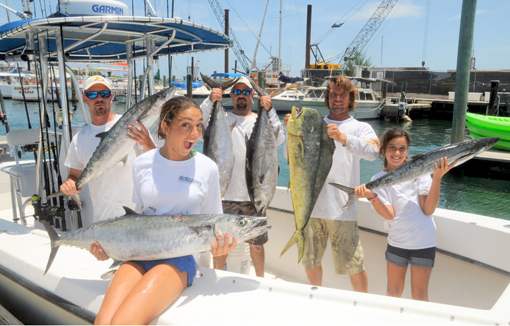 Competition begins Saturday, July 21 with participants leaving from their marina of choice at 6:30 a.m. and ends at 4 p.m. at one of the Wells Fargo Weigh-In locations at Riviera Beach Marina or the Square Grouper in Jupiter. The awards ceremony dinner will follow with cash and prizes for the heaviest kingfish, dolphin and wahoo. Prizes are also awarded in the ladies and junior divisions. “The Horizons Fishing Tournament offers our supporters and their families the opportunity to enjoy a great weekend filled with fun activities and friendly competition,” said Greg Leach, President of Hospice of Palm Beach County Foundation. “We are also pleased to announce that acclaimed marine artist and conservationist, Carey Chen, will be creating a custom-designed t-shirt for our popular kingfish, dolphin and wahoo competition,” added Leach. Pre-event registration is $200 per boat, with a special registration package available of $250 that includes 5 t-shirts. On June 16, registration is $250. Registration on the day of the tournament is $300. To register for the 13th Annual Horizons Fishing Tournament, call (561) 494-6884 or visit www.hpbcf.org. Since its founding in 1978, Hospice of Palm Beach County has cared for nearly 70,000 patients nearing end of life. Its services, including physical, emotional and spiritual care for those with terminal illness and their loved ones, is provided regardless of ability to pay.